Narito Namizato completed a hard day’s work with six points and six rebounds on Saturday, and then went on to score 11 points on Sunday. The Ryukyu Golden Kings were in perfect form, keeping the hometown fans on the edges of their seats cheering as they ripped the hapless Rizing Fukuoka twice in Turkish Airlines bj-league play. Morihisa Yamauchi scored eight points on three shots in Saturday*s game. 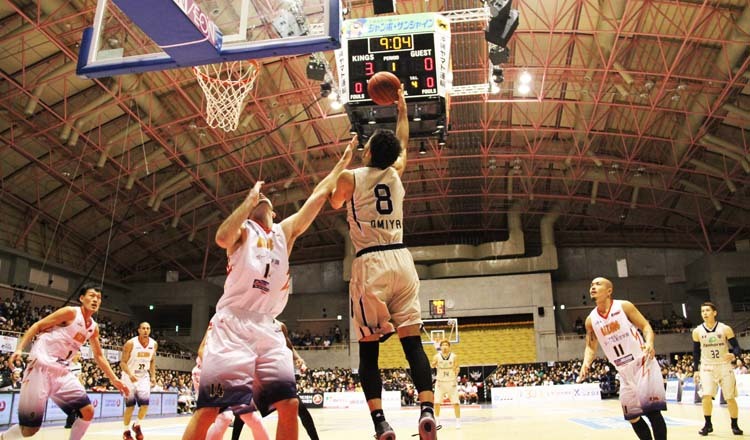 Free throws were the key to Okinawa’s series opening win Saturday, dumping in 25 en route to an 82-70 victory over Fukuoka, who had been seeking a third victory on the year. It didn’t happen, as Draelon Burns and Ryuichi Kishimoto each tallied 17 points, while teammate Anthony McHenry added 15, plus nine rebounds, to keep the Golden Kings ahead throughout the game. Morihisa Yamauchi scored eight points on three shots, while Kibwe Trim contributed seven points and nine rebounds. Hiromasa Omiya also racked up seven points, along with eight rebounds and a pair of steals, while Narito Namizato picked up six points and six rebounds. First year player Hiromasa racked up seven points on Saturday and eight on Sunday. Elsewhere in league action, the Iwate Big Bulls were untouchable, upending the lowly Tokyo Cinq Reves 109-53 and 100-68 to extend their record to 9-1. Tokyo is 3-7. The Sendai 89ers fared better, dominating their series with expansion team Fukushima Firebonds. The 89ers took the opener 95-76 for their sixth win of the season, and then buried the Firebonds 82-55 in the Sunday afternoon contest for a seventh. The Firebonds are now 1-9. 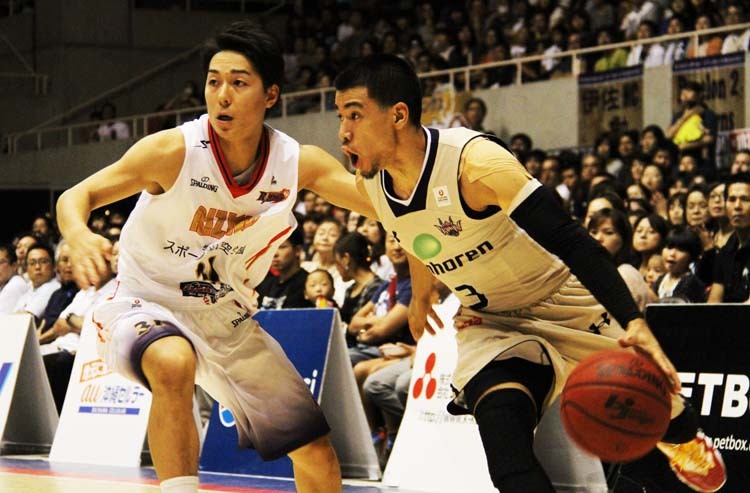 The Kyodo Hannaryz had little difficulty in manhandling the cellar dwelling Shimane Susanoo Magic, picking up 69-57 and 61-60 victories against the winless hosts. Kyodo is now 9-1. The Oita HeatDevils split a series with the Shiga Lakestars, winning 87-78 in the opener, but falling 71-60 in the Sunday game. The Lakestars improve to 6-2, while the HeatDevils are 3-7. Meanwhile, the Toyama Grouses swept a series against the Aomori Wat’s, 78-71 and 95-88, to stay atop conference standings with a 9-1 record. Aomori falls to 6-4. The Osaka Evessa were happy with a pair of victories against the Takamatsu Five Arrows, improving to 6-4 in the process. Osaka won 82-68 and 82-73 against the 3-7 Five Arrows. The Niigata Albirex BB were pleased with their weekend as well, drubbing the 0-8 Gunma Crane Thunders 73-68 and 81-71 to extend their record to 8-2. The Akita Northern Happinets were happy with the weekend’s action, sweeping a series against the Yokohama B-Corsairs to extend their record to 8-2. 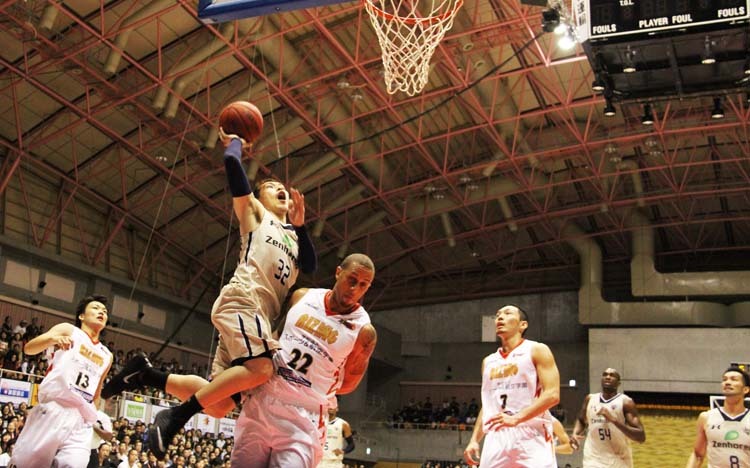 Akita took Saturday’s game by a 20-point margin, 79-59, and nearly matched that Sunday with an 18-point win, 92-74. Yokohama falls to 3-7. 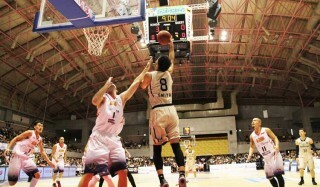 The Shinshu Brave Warriors kept the Saitama Broncos winless, thumping them 90-78 and 91-81 to even their record at 4-4. The Broncos are 0-10.